Have a little Easter fun with your young one and use Easter eggs to practice prewriting! Check out this Easter Egg-Themed Prewriting Practice from 3 Dinosaurs! Included in this resource are 7 pages of giant Easter eggs with lines in them. There are multiple different styles of lines from straight ones to zigzags. Your child can use paintbrushes, crayons, pencils, or markers to follow the lines on each egg. Laminate for daily practice over the Easter holidays! For other Easter resources, check out BIG List of Easter Learning Resources! 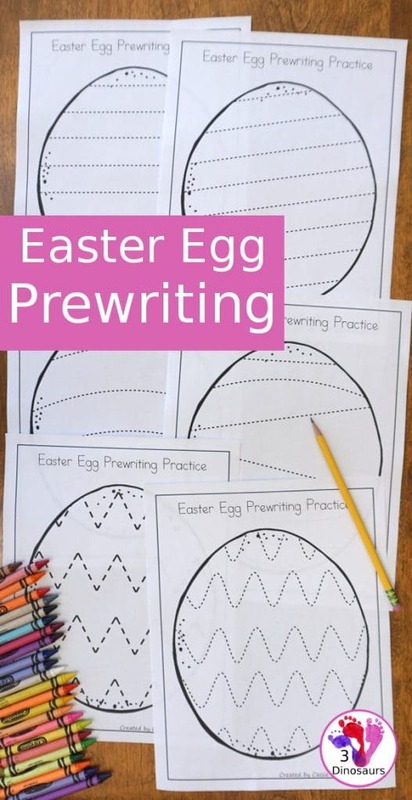 Grab this Easter Egg Prewriting Practice here!